Hike yo an unusual or interesting locality. Hike a planned route on a dam or waterway. Write at least a five page log (that includes a strip map of a certain section of the hike) and submit it to your Scouter for approval. The log must be submitted within two weeks of the expedition. As part of your preparation for this expedition you must have achieved the First Aid Scoutcraft badge. Devise a safety checklist for your house or other building. After approval by your Scouter, use that checklist to make an inspection of the building. Hazards that could be checked include: oil lamps; pressure stoves; synthetic material, silk, nylon, Christmas decorations; plastics; inflammable liquids; electrical outlets or appliances; Liquefied Petroleum Gas (LPG), etc. Explain the hazards found, why they are hazardous and how they can be corrected. Within the constraints of your ability and finances correct these hazards you have identified. While on a camp, assess the potential hazards in and around your campsite. Compile a list and discuss these hazards with your PL or Scouter. Assist in rectifying these hazards. Give an accurate account of an incident, either natural or staged, lasting at least 1 minute and involving at least 3 persons to your PL or Scouter or designated person. At an accident scene staged by your PL or Scouter, demonstrate an ability to take charge of the scene of an accident. As part of the incident you should ensure that the scene is made safe, that other first aiders are conscious of their and the patient’s safety and that the incident is properly reported to the proper authorities. Use your first aid skills to provide basic first aid to the patient. Produce a proportional drawing or a model of a standing Patrol campsite, making use of the equipment available in your Troop, and explain reasons for the layout. Demonstrate your ability to assist your Scouter or PL in planning one part of the logistics: like first aid or meals and food shopping or sourcing of equipment for a Troop or Patrol camp as well as assisting in the training of younger Scouts on the camp. Be responsible for one specific aspect of the camp. Cook a balanced dinner in a backwoods style (without the use of pots or standard kitchen utensils). Bake a loaf of bread over a fire. Earn the Survival Scoutcraft badge. Demonstrate ways to stalk and track animals including the use of camouflage. This exercise should include the solving of a tracking story set by the examiner or tracking an animal for 500m in the bush. How to identify animal spoors at a waterhole, beach or place where spoors or footprints are evident. Making negative or positive castings or sketches of a variety of impressions and identify the animals involved. Developing a bird or animal list from the spoor prints or observing the changes in bird and animal life at three different times in one day. Any similar activity approved by your Scouter. Write an article or report on a Scout event that you have attended or a component of your Troop history for a paper or Troop blog or website. Organise a wide game or similar activity in a public area in uniform. Identify an outdoor environmental service project to improve the quality of the environment in your community. The total project should take six hours. Complete this service by yourself or lead your Patrol in meeting this need. Attend three Patrol in Council meetings and explain the functions of both the Patrol in Council and Court of Honour (COH) to your Troop Scouter. Attend a course or fulfil the criteria for LDC2 (Leadership Development Course 2). 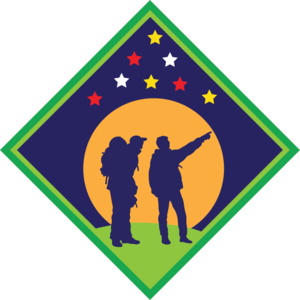 Demonstrate your ability to instruct Scout(s) in a Scouting skill. Assist in planning a Scout's Own and help run it on a camp. Lead a song or other activity at a Scout campfire.